Superb 12-inch tall action figure honors the Eighth Doctor! The Time Lord wears his costume from the TV movie. Features a fully realized likeness of actor Paul McGann. Accessories include a key to the TARDIS, a beryllium chip, a sonic screwdriver, and more! 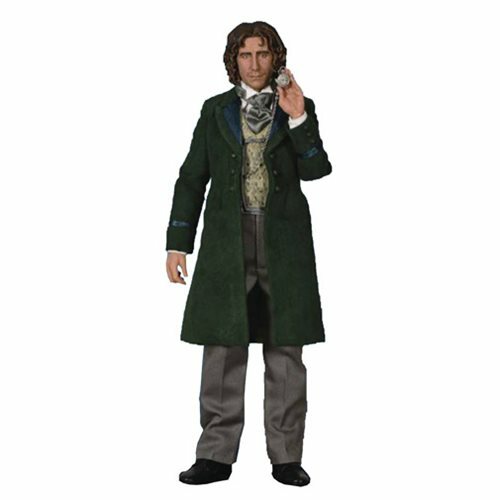 Big Chief Studios presents this superb 12-inch tall action figure honoring the Eighth Doctor. Featuring a fully realized likeness of Paul McGann as the Time Lord in his costume from the TV movie, the Doctor Who 8th Doctor TV Movie 1:6 Scale Action Figure comes with numerous accessories that include a key to the TARDIS, a beryllium chip, a sonic screwdriver, and more.